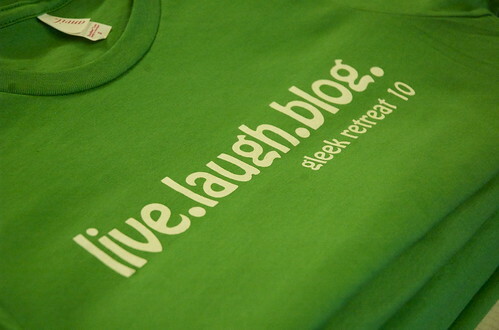 That’s the slogan on the t-shirt that I brought home with me this weekend from Gleek Retreat 2010 – and it pretty much says everything. Ok, so maybe not exactly everything. But it definitely sums up what was an intense, amazing, educational, inspiring, fun and just plain awesome experience rather well. I’m still trying to process everything that happened over the weekend – the conversations, the sessions, the beautiful location… And mainly just the whole ‘Gleek-iness’ of it all. I didn’t take many photos – for once. There’s a lot of reasons why – I was sitting in the back during the first day of sessions, so my one attempt at a photo included the backs of people’s heads. And I still really struggle with indoor photography, trying to get a decent photo that’s a) visible and b) crisp and clear doesn’t seem to be very possible with my current camera (as you’ll see below). Then again, I’m still learning how to use it, so maybe it’s me. But there were many others there taking pictures, so I might borrow where I can as theirs get uploaded later on. The setting for this conference was in a word – perfect. Small, self-contained and provided a relaxing atmosphere. It’s a retreat center originally built to house scrapbookers and now expanding for business retreats, bridal or baby showers, or any other kind of get-away that an individual or group is looking for. The name is ‘Into The Woods’ and that is a very good description of where the center’s located. The accommodations were amazing, the food was incredible and from what I saw of the prices, they look very reasonable. Honestly though, the very best part of the entire experience was getting to meet and talk to the other bloggers who were there. Whether I’d met them in ‘real life’ before or not, I truly feel like I came away with some amazing connections – and friends – who will last long afterward. At least I hope so. 🙂 The thoughts and ideas and brainstorming and excitement… It’s wonderful to be around a group of people who truly care about sharing with each other and helping one another out. And there are so many ways that we can work together to not only improve our own blogging, but to help each other improve too. And to take ourselves beyond the blogging to open up new opportunities and choices – oh, I’m still so geeked (no, GLEEKED!) about it all. I’ll try to share more from the weekend in upcoming posts, but I wanted to put my initial thoughts down while everything is still so fresh. And that reminds me – I can’t even imagine the amount of time and effort that it took to put this whole conference together. To plan and execute it so successfully – in only a few short months… Thank you so much to Jodi and Stacey for first of all, deciding that West Michigan needed a blogging conference – but then also taking it beyond the ‘wishful thinking’ stage to jump in with both feet (four all total, lol) and do it themselves. You ladies are truly amazing and I’m so glad that I was able to come and be a part of the first annual Gleek Retreat!